The AC franchise hit a home run this year with Syndicate. So many quality-of-life improvements went into refining the experience of traversing the world, and the beginnings of customization system that makes sense are starting to emerge. The story was intriguing and the side missions worth doing — overall not a dull moment. My wife, who doesn’t normally go for the violent games at all, was very interested in the presentation and setting, along with the interesting story points. Playing together was a ton of fun as we completed nearly everything there was to do in the game. The toys-to-life genre exploded in 2015. I could have easily put Skylanders on this list, and perhaps LEGO Dimension will be once I get to playing it (see the end of this post) but I decided to go with Disney Infinity 3.0 because of how much the presentation and stories captured my interest. Being able to play through the familiar Star Wars settings was a blast, and I like how each one has a slightly different take or another angle to go along with the main story we all know. I enjoyed making a little youtube series following my progress through the first playset (Twilight of the Republic). I have plans to do the same here very soon for Rise Against the Empire and the brand new Force Awakens playsets that just released. Nintendo’s first real foray into online shooters did not disappoint. Splatoon was a breath of innovative fresh air. The inking system, weapons, and presentation were all very enjoyable. 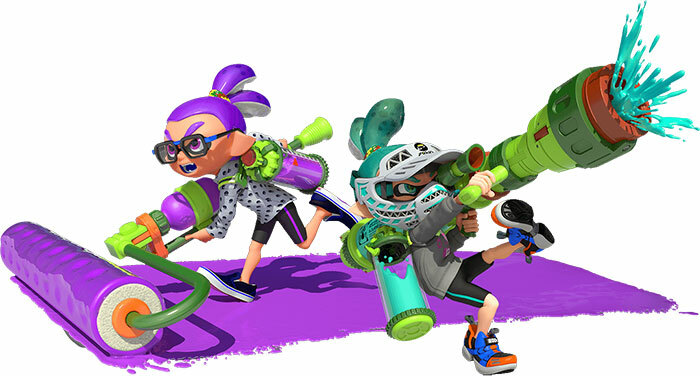 Nintendo’s constant stream of updates, especially in the first two months, made each week exciting to see what new maps, weapons, and outfits were added. Nintendo captures the spirit of gaming in Splatoon, and honestly that can be said for the other great games they released this year like Mario Maker. Why is this on my list you ask? Why do I keep bringing up a game that is nearly 20 years old? Because I put over 280 hours into the game in 2015, and gave the company who made it almost as much money as I gave to Disney and Nintendo. Both Ragefire and now Phinigel have given me more MMORPG enjoyment than I’ve had in years. People used to love to sling the “if you love it so much why don’t you go back and play it” line at me. Well, I did. And guess what? It’s awesome. Still going strong on Phinigel. Now I should note here that I still have a backlog I’m working through, and several games on my Christmas List. Here are just a FEW of the games I still need to play, which could have easily been on this list had I been able to get to them. Did I forget any games I should have mentioned in my backlog that you haven’t seen me cover before? Should I be adding more to my backlog? Let me know what you think were the best games of 2015. It’s on my list of backlog! Check the bottom bullet list. I haven’t gotten to it yet. 🙂 I plan to! I highly recommend ARK, although realistically you should go into the game with a small group (3-4 will do) to avoid the biggest pains. They really should take off the Early Access tag too, its more feature-complete and stable than most released games, and gets updated more than any MMO. It ultimately breaks down into the same thing that playing Rust or a similar game breaks down to, but until you hit that mastery point (easily 100+ hours), is a great great time. Witcher 3 you don’t need to play 1 or 2, although you will miss a ton of references to past events and characters. Not “I have no idea what is going on” territory, but still a bit confusing and not a ‘full’ experience. Witcher 1 is amazing and still worth playing today, but Witcher 2 is a total dud IMO. 3 is good, but in a lot of ways it feels like playing single-player GW2 (enter zone, travel to every marked object on your map, clear object, repeat) with a really bad loot/crafting system and some other major pain points. It’s also still rather buggy, and prone to performance issues (at least on the PC). If I loved DAOC will I love Everquest. Never played it. @Jay P: Did you love DAOC’s PvE? If yes, then give it a shot. Its all about groups and fighting mobs in an area/camp. The games are so drastically different, though, that I can’t say “yes” with absolute certainty. Both games are from a time where when a new game released it wasn’t 90% the same as a previous game with a new twist. Both games are islands unto themselves. @SynCaine: I might get Ark on the consoles. I can play with Graev there and it’ll be more fresh for people. Not sure I’d last playing it on the PC. Witcher 3 will be on my “Grab on a crazy sale when the rest of the backlog is gone” game for me. @jay I doubt it. And I dabbled enough in early DaoC to know they are vastly different. And the graphics are just really bad now, but the mechanics are still compelling. If you find not being able to do anything meaningful solo compelling, and I do. Thinking of trying Ark myself at some point but will probably do that on my Xbox One. I highly recommend picking up Witcher 3, it’s well worth the sale price tag if you enjoy open world rpgs. Don’t really see the similarity with gw2, especially since I could never really get into gw2 and witcher 3 does not feel mmo-like to me whatsoever. I guess it depends if you are playing it with an mmo mind set. I approach mmos a lot differently to single player rpgs in that I like to immerse myself in the world and character I am playing. This is mostly because mmos tend not to provide the kind of world, lore, and playstyle that promotes immersion. I found Ark most enjoyable on an RP server with decent backing (Admin/Mods and a good community). I recommend Arkrp.com if you happen to take the plunge.